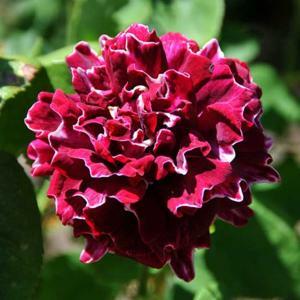 Double maroon red flowers with fringed petals delicately edged white, produced in early summer and sporadically repeating later. Fragrant. Vigorous bushy habit. Unfortunately susceptable to black spot and mildew. Fertile, moist, well drained soil in an open sunny position. Needs good soil to thrive, otherwise can be problematic.